Milos Raonic is heading into this year's Rogers Cup in a different position than the one he's become accustomed to over the last few years. Supplanted by teenager Denis Shapovalov as the top-ranked Canadian in the men's singles draw, there's suddenly a lot less outside pressure on the Thornhill, Ont., product to succeed in the lone ATP Masters event on home soil. But Raonic, who ranked as high as No. 3 in the world two years ago, said he never felt expected to carry Canadian tennis on his shoulders anyway. "It's fun to have other guys doing well but it's never been a burden, it's never been anything," Raonic said Sunday. "It's just been me doing the best I can in every situation that's ahead of me. "It's definitely a lot of fun to have [Shapovalov and fellow up-and-comer Felix Auger-Aliassime] around doing well, to see them coming up and coming up quickly. But I don't think it's made any sense of a direct impact in any way of making something easier." Raonic, now ranked 30th on the ATP standings, begins his Rogers Cup tournament Monday night against 10th-seeded David Goffin of Belgium. The 19-year-old Shapovalov (No. 26) starts Tuesday night against France's Jeremy Chardy while wild card Montrealer Auger-Aliassime (No. 134), who'll turn 18 this week, takes on Lucas Pouille of France in his Rogers Cup main draw debut. 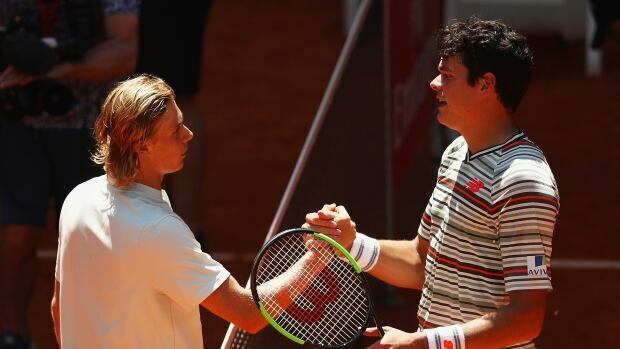 Raonic last played Goffin in Madrid in 2017, losing in straight sets in the third round. But he also had one of his best matches of his career against Goffin, rallying from two sets down to beat him in the Round of 16 at Wimbledon in 2016. It's been an up-and-down road for Roanic since then, with a rash of injuries — including a quad tear at Wimbledon last month — sending him tumbling down the world rankings. He hasn't competed since Wimbledon but said Sunday he's felt great over two weeks of practising in Toronto. "I guess one of the things I've had the luxury of is being hurt quite a few times so I have that experience," Raonic said, drawing a few laughs from reporters. "I know how to reset." Shapovalov has only faced Chardy once, beating him in the first round at Wimbledon this season. But he called that victory a confidence booster heading into Tuesday's match. The crowd should help ease any nerves, too. "I always tend to bring out a good game at home when I'm playing either in Montreal or Toronto," Shapovalov said. "So I'm fairly confident with my game right now." This will be Shapovalov's second time in the main draw at a Rogers Cup in Toronto (he made it to the second round of the 2016 tournament), but first since his breakout season last year that saw him skyrocket up the standings after a semifinal loss to eventual champion Alex Zverev of Germany in the Montreal event. And Shapovalov said he's only improved in the year since. "I feel more comfortable out there with really anybody," he said. "I feel like I can beat any player with a good game. I don't have to play out of my league." Shapovalov, who grew up in nearby Richmond Hill, Ont. — roughly a 20-minute drive from Toronto's Rogers Cup home on the York University campus — remembers watching his favourite players compete here as a kid. His favourite memory was at the 2014 tournament when he worked as a hitting partner for Roger Federer, warming him up before his semifinal win against Feliciano Lopez on Centre Court. Two days before competing on that same court, Shapovalov said he's trying not to think about the hype that comes with being the top ranked Canadian at the tournament. "For me the most important thing is my game, it's improving, it's getting better," he said. "So I don't really try to focus on anything outside that." Raonic will be competing in his 10th Rogers Cup — and sixth in Toronto — and said the excitement of playing in his hometown tournament hasn't worn off. Nor does he expect it to. "I always say when things are a bit difficult in a match it makes it a little bit easier getting the energy from the crowd," he said. "And when things are going well it makes it last a little bit longer. "I think it does make a difference and it's important that you embrace it."